ambrosia --- (1) The name of a beetle that attacks some woods, particularly maple. Interestingly, this "group" of beetles is NOT a taxonomic group but rather a diverse range of otherwise unrelated beetles that share the characteristic that they have a symbiotic relationship with a particular fungus, called ambrosia fungus. It is this fungus that causes the discoloration found radiating up and down the grain from the holes that the beetle creates as it bores into the wood. Further, the beetles don't eat the wood, they excavate it; their point in digging into the wood is to deposit their larvae. These beetles do not normally kill the trees they bore into, but if a sufficiently large number of them use one tree, they can kill it because the fungal growth clogs up the flow of tree nutrients. ambrosia --- (2) Wood attacked by the Ambrosia beetle, which leaves holes, around which there is a heavy discoloration of the wood caused by the fungus that lives in symbiosis with such beetles. This is something that happens most often in maple. I cannot at the moment think of any other species that it happens to but from all reports, these beetles burrow into lots of different types of trees. 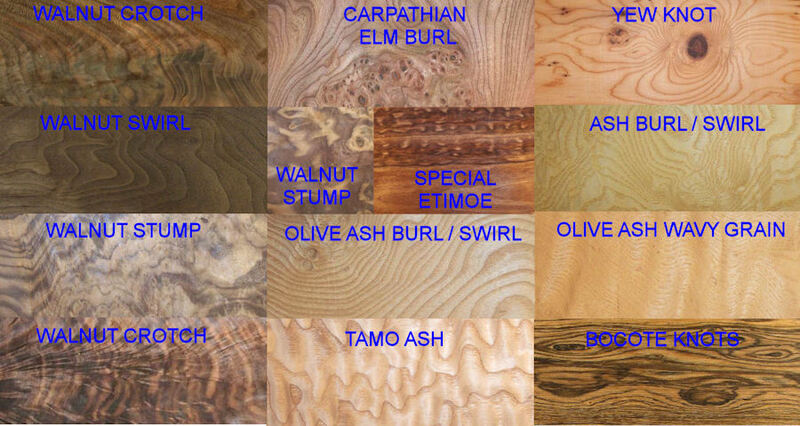 Here is a pic showing ambrosia maple in various forms. These planks and turnings all have a relatively high density of markings; it is more normal to see ambrosia maple with considerably fewer markings per area of wood than this, and solid wood with heavy ambrosia markings is highly prized by wood turners. annual growth rings --- Trees in temperate climates grow at different rates during the seasons, ranging from exuberant early growth in the spring when the sap is flowing in the tree and in the early summer, to a slower late growth in the late summer and fall, becoming more dormant as the winter sets in, to essentially none in the winter itself. The early growth is also called "spring" growth and the late growth is also called "summer" growth. The early growth is typically wider, less dense, weaker, and more porous (in hardwoods) than the late growth and in many cases is significantly lighter in color. These seasonal growth spurts create differing cell structures which, when a tree is cut perpendicular to the axis of growth, show up as what are called "rings", for the obvious reason that they are, geometrically speaking, a series of concentric rings that start at the center of the tree and occur outward, one for every year of the tree's growth. NOTE: false rings occur in some species, sometimes due to a late frost, others due to unknown reasons. Tree rings can be counted to tell how old a tree is, and the size of the rings can tell a lot about the growth conditions of their year (e.g. drought years as opposed to plentiful rain years). 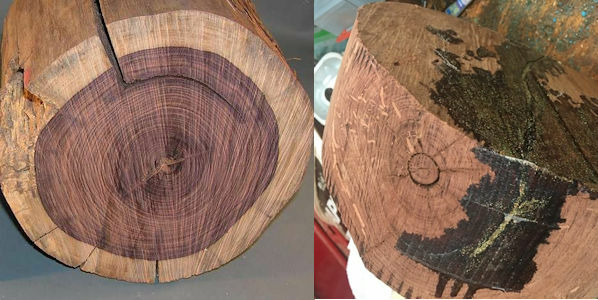 By working with long-dead trees, whose growth rings ended many years ago, and overlapping them with trees whose earliest growth rings happened before the older tree died, scientists have been able to date some events back for several thousand years. Trees that grow in tropical zones (that is geographic regions where there is little change in climate throughout the year) grow pretty much the same amount every day throughout the year and consequently have little variation in texture. In some tropical zone species (e.g. black gum and sweet gum) and many tropical species, particularly those whose growth ranges do not get too far from the equator, annual growth rings can be anything from very hard to detect to essentially non-existent. bark inclusion --- An isolated area in wood, largely made up of bark that has grown into the sapwood of a tree. This can be caused by irregular growth or due to damage to a tree. 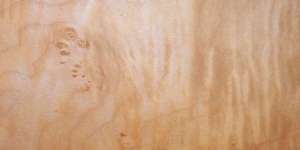 Bark inclusions are unsound and usually cause distortion of the surrounding wood grain. The bark area is frequently completely overgrown over time by new growth and thus seems to exist magically inside the tree with no link to the outer bark. They are usually fairly shallow and are also called bark pockets. Some species, such a American black cherry, commonly have bark inclusions. 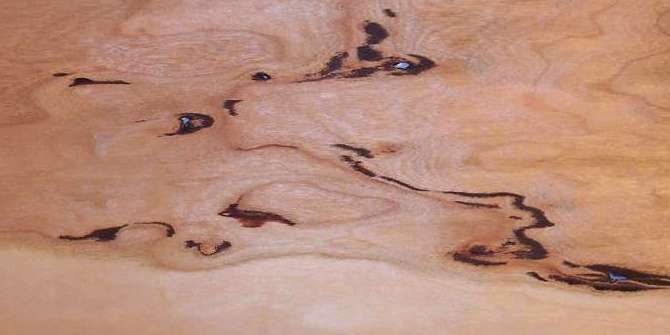 bird's eye --- A few woods (most notably hard maple but also anigre and a few other hardwoods) sometimes have large numbers of small round or elliptical "defects" that do indeed resemble the eyes of birds. This is caused by local fiber distortions but I have not found any explanation of WHY these fiber distortions develop. The density of the eyes ranges from sparse to dense, and the definition of "dense" frequently depends on the greed and/or honesty of a seller, so this is not a good figure to buy sight unseen. A good, truly dense, bird's eye maple board can make a spectacular addition to a project; it is very popular for jewelry boxes. When cut into veneers, the logs are most often rotary cut or half-round sliced (in an arc) to produce the most uniform distribution of nice round eyes. There are a few woods that are sold as "bird's eye" with a density of eye figure so low as to make the term a joke. Zebrawood in particular comes to mind for this. 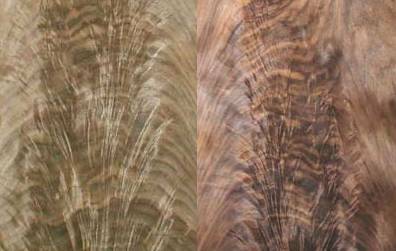 I have seen zebrawood veneer sold as "bird's eye" due to having literally 8 to 10 eyes in an area of 5 or 6 square feet. blister --- (1) A small raised surface area, similar in appearance to the blisters that occur on human skin, usually on veneer (not as wood figure but as a raised bubble of mechanical origin) or a thin laminate, or the surface of a finishing agent such as paint, and resulting from insufficient adhesive, inadequate curing, trapped moisture, an air bubble, etc. 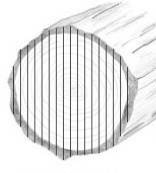 blister --- (3) Wood figure that results when there is an uneven contour of annual growth rings and a log is rotary cut. The veneer, while smooth, appears to be covered with blisters. This is a term that, like many wood figure terms, is used very loosely by vendors and should be taken with some skepticism. You will often not be able to discern why a vendor used the term blister instead of pomelle. Blister occurs mostly in West African redwoods such as African mahogany, sapele and makore. Here are examples of blister figure in a few woods, or at least that is the description given to these by their vendors. The imbuia pics are mine but the other two are from a vendor who always makes her wood look shiny whether it is or not. To see more pics of blistered wood, click here: blister pics. block mottle --- A form of wood figure (specifically, a form of mottle figure) in which the mottle is moderately well organized and has moderately well defined edges. If it is less organized it is "normal" mottle (aka "broken mottle") and if it is more strongly organized and/or has sharper edges, it is called razor mottle. Below is a pic of block mottle makore veneer. The distinctions among the terms basket weave, block mottle and razor mottle are often somewhat subjective and/or misapplied, and to make matters worse, some forms of quilted figure are very similar to block mottle. To see more pics of block mottle, click here: block mottle pics. In the composite image below, the piece on the left is clearly block mottle, the one in the middle could agruably be called quilted, and the one on the right could agruably be called razor mottle. blue stain --- Also called "sapstain", this is a form of biodegrade in wood caused by a fungus that under certain conditions will spread into wood once the tree is removed from the stump (or sometimes when injured). The fungus eats nutrients found primarily in the sap, so it usually only occurs in the sapwood and not the heartwood. It does not occur in live trees because live sapwood does not contain enough oxygen to sustain the fungus. The color is the fungus itself rather than a chemically induced change in the color of the sapwood, and the presence of the stain does not in any way degrade the integrity of the cell structure (that is, it does not weaken the wood at all) and thus its presence does not count against wood in the grading process. Once present, its effect can be somewhat mitigated, but it cannot be removed completely. It is common in pine and maple but also occurs in many other woods such as anigre and aromatic red cedar. The color is usually blue but may also be gray and or even dark gray verging on black. The fungus can reach a tree as airborne particles or it can be deposited on them by flying insects, such as the pine beetle, which in turn gets it from the air or from another tree. There are extensive articles on the internet discussing it and how to avoid it and even how to reduce its effect (but again, once it's there you can't get rid of it totally --- you need to avoid it during drying). It does not normally start to affect logs for many days, sometimes weeks or more, and of course, usually does not occur at all, but it CAN start immediately after cutting and have a pronounced affect within just a few days. One of my correspondents who uses a lot of aromatic red cedar tells me that it commonly occurs in that species within days of the tree being cut down. Below is a piece of aromatic red cedar with blue stain. For other pics of wood with blue stain, see blue stain pics. brown stain --- (1) A wood stain caused during kiln drying due to oxidization on or just under the surface of the wood. The staining is most likely to occur when fresh, unseasoned lumber is stacked and stored for several days during warm or humid weather prior to kiln drying. It is particularly likely when high kiln temperatures are used. brown stain --- (2) A rich brown to deep chocolate-brown discoloration of the sapwood of some pines caused by a fungus that acts much like the blue-stain fungus. burl --- A wart-like, deformed growth on the trunk or root and sometimes even the branches of a tree, caused by (1) an injury to, or (2) and infection in, the tree just under the bark, or (3) the existence of an unformed bud which has all the genetic material necessary to grow a full branch, or even a whole tree, but which for some reason did not grow properly. In any case, the result is that the tree cells divide and grow excessively and unevenly in a process somewhat analogous to cancer cells in a mammal. Burls are sometimes called tumors on wood, although I'm not aware of their ever being fatal. Trees with burls continue to grow otherwise normally. Continued growth follows the contour of the original deformity, producing all manner of twists, swirls and knots in the wood fiber. Usually, this results in wood that has a spectacular pattern that can be used to great effect in woodworking, and sometimes it is also accompanied by the creation in the burl of dormant buds which create eyes that make the burl even more spectacular when worked. Burl wood is usually darker than the rest of the tree and in some cases (Paela comes to mind) may be a significantly different color altogether. Because of the diverse grain direction, burl wood cannot be relied on for strength, but that's of little consequence since burls are prized for beauty, not strength. Burl wood can be difficult to dry without cracking. Sometimes there are bark inclusions in burls, and also sometimes gum pockets and other voids, any of which can cause surface defects when the burl is worked. Root burls are particularly prone to voids. In some species of wood, gum pockets are common in any burl found on the tree. Burls come in all sizes and shapes from golf-ball and smaller to hundreds of pounds of massive growth on the side of a large tree. Burls as large as 4 feet by 8 feet have been reported as have trees with hundreds of small burls. On really large trees, such as the redwood, burls commonly exist that are large enough to be used to create veneer. Burl veneer frequently does not stay flat after cutting and has to be moistened and clamped flat before and/or during application. A couple of commonly identified types of burl figure are Cat's paw and cluster burl. Cat's paw is frequently found in cherry and cluster burls are found in a number of species. Most often, burls have no sub-designation and occur in a large number of species. Common burl species include redwood, oak, ash, maple, madrone, elm and walnut. Some exotics with very popular burls are mappa (poplar burl), thuya and imbuia, and there are MANY more. cat's paw --- A type of cluster burl where there is an isolated group of small eyes that fall more or less in the shape of a cat's paw. Below is one example and to see more, click here: cat's paw pics. chemical stain --- A chemical discoloration of wood that is believed to be caused by the concentration and modification of extractives. This may occur as part of the tree growth or it may occur as a drying defect in kiln drying, due to the heat of the drying process. clear vertical grain --- A lumber grading term that means no knots ("clear") and with the annual growth rings perpendicular to the face of the plank ("vertical grain"), which of course means quartersawn. As with the term quartersawn, You can get into religious arguments about whether it means "true" quartersawn, that is, growth rings at or VERY near to, 90 degrees to the face, or whether instead it is meant to include any angle up to [add your own choice of definition here]. Personally, I'm an engineer and to me something that leans over, say 30 degrees, is absolutely NOT vertical, but in woodworking 30 degrees would be well within many definitions of quartersawn. close grained --- NOTE: the word here is "close" as in "not far apart", not "closed" as in "not open" --- this distinction is important because of the similar term "closed grain"
close grained --- (1) synonymous with tight grained and generally synonymous with fine grained. Compare/contrast to open grained and loose grained. close grained --- (2) Sometimes used, incorrectly I believe, as a synonym for fine textured and the reason I believe it to be incorrect in that sense is that a wood that has close annual growth rings does not automatically have fine texture (although it usually will). I think this is a use where the user has gotten it confused with closed grain, which sometimes DOES go with fine texture. coarse grained --- (1) Refers to wood that has large, open (i.e. coarse) pores (see open pore. Compare/contrast to fine grained and medium grained. coarsegrained --- (2) [less frequent use] Refers to wood that has widely spaced growth rings (see loosegrained. coarse textured --- having a rough surface, often caused by, or at the very least accompanied by, large open pores. Compare/contrast to fine textured and medium textured. color variations --- All woods exhibit some degree of variation in the color produced by a single species, due to variations in growing conditions such as soil composition. 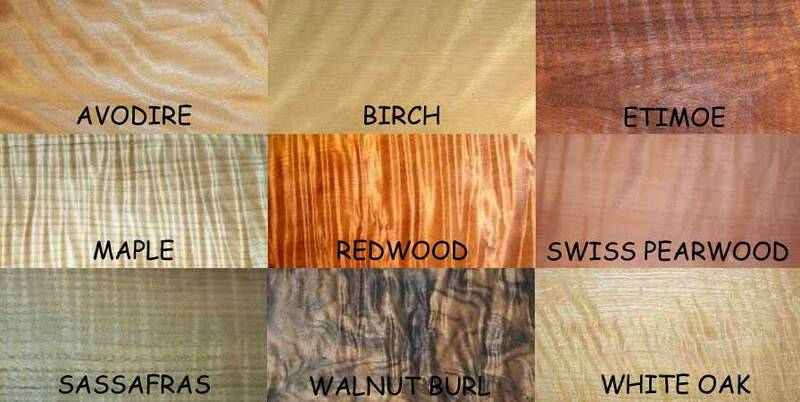 Also, many species have color variation between early wood and late wood. However, with some species it is quite common to have considerable variation of color within a localized area of a single tree and this can often be exploited to good effect by the craftsman. crossfire --- A general term applied to all the various types of figure markings in wood that run across the grain and which are generally caused by interlocked grain, such as mottle, curly, and fiddleback. I have seen some definitions that restrict crossfire to just mottle figure, and others that restrict it to just curly figure, but I believe those are incorrect usage based on ignorance (on the other hand, it could well be that I'm the ignorant one; it's been known to happen). crotch --- The area where two trunks of a tree join together or the area when a branch joins the trunk of a tree. In such areas, the wood is under extra strain and creates tension wood The tension wood merges into normal wood as you move away from the crotch area, so crotch wood frequently exhibits an extreme degree of grain variation. The tension process that strengthens the tree so it can support the branch causes the wood fibers to twist and compress, creating various figures and grains that can be very beautiful. Unlike burls, crotches have grain that, while quite distorted, is basically the same grain as the other wood in the tree and does not tend to the extreme swirls and eyes of burl wood, but even so, crotch wood can be wonderful to behold. Crotch wood is typically harder and more dense than a straight grained portion of the same tree. Depending on the appearance, a crotch may be called a flame crotch or a feather crotch (and less frequently as "plume", "roostertail" or "burning bush") and frequently the crotch area is somewhat symmetrical on both sides of the branch so that a crotch piece cut parallel to the trunk of the tree will produce a look similar to that of book matching. Terms such as "feather" and "flame" should not be relied on if you haven't actually seen the wood, as they are used VERY freely. I've seen one gun-stock maker who openly states on his web site that he always calls all crotches flame crotches because "it sounds more impressive". I assume that the stupidity that makes him think dishonesty is worthwhile also prevents him from realizing that advertising his dishonesty isn't really a good idea. In veneers, crotch sheets are seldom found in large sizes (although I have seen some HUGE mahogany crotch sheets --- I'm talking 3 feet by 5 feet), and mahogany and walnut species dominate the field of crotch veneers because they are the main trees that consistently produce large crotch areas. In mahogany, enough veneer has been produced to be able to establish grain pattern types. Thus one can select a swirl, a feather, a rat-tail, and others. Mahogany has always been the classic crotch because of consistency, size, and soundness. The price range is moderate to expensive. crown cut --- A veneer cutting technique that is reported variously as being either identical to flat cutting or as a very slight variation on flat cutting wherein the wood is not sliced exactly tangential to the growth rings but rather at a slight angle so as to provide a cathedral grain figure (U- or V-shaped arches in the wood grain). Although, as I said, some definitions show it as looking identical to flat cutting, I believe that their intent is that it not be actually called crown cutting unless it produces a cathedral figure. Depending on the tree growth, flat cutting in which the slicer is parallel to the pith but the growth rings actually taper inwards as the radius of the tree decreases with height, will produce cathedral figure because the growth rings are being cut at an angle in that case. In the composite pic below, there is white ash and red oak, both with a strong cathedral figure. curly --- The word normally used to designate curly figure, which term is listed in this glossary as "curly figure" instead of just "curly" so as to distinguish it from "curly grain" which is a whole different thing. curly figure --- Contortions in grain direction sometimes (interlocked grain) reflect light differently as one moves down the grain and this creates an appearance of undulating waves known as curly figure. It is frequently described as looking like a wheat field in a mild wind, or the rippled surface of sand just under the surf at the beach, and can be so strong an effect that your eyes will swear that a flat piece of wood has a wavy surface. Many species develop this figure, maple being a very common example. Stump sections of trees often produce a diagonal, staircase-like curl referred to as "angel step" figure, and a rolling curl figure that is sometimes called "cross-fire". An extreme form of curly figure is called "fiddleback". The amount of curl in a wood sold as "curly" can range from almost none to truly spectacular, so this is not a term to be trusted via mail order purchasing. Below is a composite pic with numerous species with curly figure. To see more pics of wood with curly figure, click here: curly wood pics. curly grain --- synonymous with wavy grain. If used as a synonym for curly figure then it is being used incorrectly. demarcation --- A term referring to the point of separation of two parts. In woodworking it is used to describe the boundary between heartwood and sapwood, and less often to describe the boundary between earlywood and latewood so you will see phrases such as "razor-sharp demarcation" meaning that the separation between the two is very distinct. It isn't always very sharp, as you can see in these examples of heartwood/sapwood boundaries. The zircote, cocobolo, and blackwood have very sharp demarcations and the black walnut and white oak have very vague demarcations and the rest of them are somewhere in the middle. edge grain --- synonymous with side grain and does NOT have the same meaning as edge grained. edge grained --- synonymous with quartersawn because in quartersawn planks, the "flat" face (that is, the tangential surface) is actually on the edge of the plank, not on the wide face as it is on flat cut planks. Compare/contrast to side grain, end grain, and face grain. end grain --- The wood grain as seen looking along a line parallel to the centerline up and down the tree (looking into the end of a plank, as opposed to the side or face). The end grain of a board has significantly different absorption characteristics from the face and edge, and consequently some finishing agents (such as stains in particular) can look VERY different on the end grain than on the face or edge. All of the edges of panels made of composite material are effectively end grain and should be thought of as such when applying finishing agents. The characteristics of end grain in wood are the more readily available anatomical features in wood that are of great use in identifying species. 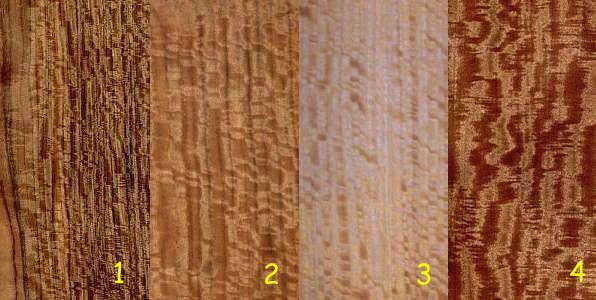 Compare/contrast to side grain, edge grain, edge grained, and face grain. 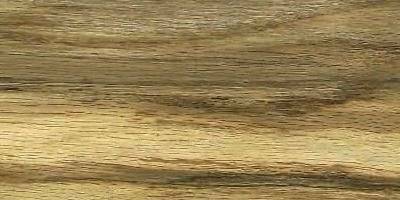 face grain --- The wood grain as you look directly onto the face of a plank or panel, although in common use it generally carries with it an implication of flat cut as opposed to quartersawn. That is, the term is sometimes used to mean the flat cut face of a board even if that fat cut face is actually the edge of a quartersawn board. Compare/contrast to side grain, edge grain, edge grained, and end grain. feather crotch --- [also called "flame crotch"] A particularly attractive crotch area that looks a bit like a feather or a flame. Whether a crotch area is called a feather crotch or a flame crotch is entirely up to the vendor, many of whom are overly optimistic about the extent to which their merchandise deserves the designation. I've seen one gun-stock maker who states on his web site that he always calls all crotches flame crotches because "it sounds more impressive". Below are a couple of black walnut crotches that are either flame or feather, take your pick. My pick is that the one on the left is feather and the one on the right is flame, but when I made that decision I was favoring my left leg and squinting in my right eye so you might see it differently. A term that is sometimes used with feather/flame crotches is "rat-tail" which refers to the central spine of the crotch. I find the term "rat-tail figure" to be ridiculous since the rat-tail being referenced is just a part of the crotch. Three other terms that I have found, that purportedly are used as synonymous with feather crotch, are "rooster tail", "plume", and "burning bush", HOWEVER ... in almost every case that I have found these, the three terms have been used in that sequence with EXACTLY the same phrasing. My conclusion is that someone on the Internet put up a definition using those terms and it got copied several times. I've never seen any of the terms actually used with wood for sale and I do not consider the sources where I found them to be reliable. 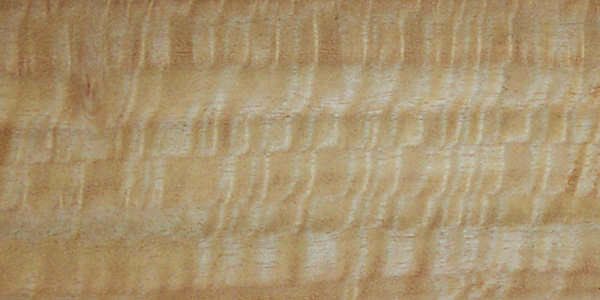 fiddleback --- Curly figure in wood (and fiddleback is just a variation of curly figure) is caused by contortions in grain direction (interlocked grain) such that light is reflected differently at different portions of the grain, creating an appearance of undulating waves, also called a washboard effect because it looks like an old corrugated steel washboard. "Fiddleback" figure is a form of curly figure where the curls are very tight and fairly uniform, generally running perpendicular to the grain and across the entire width of a board. The name comes from the fact that such wood became popular to use on the backs of violins (fiddles), and nowadays guitars, because the figure is frequently very lively and attractive and such wood generally has good resonance properties. It is also commonly used on drums and also for architectural panels. Logs for fiddleback veneers are quartersawn to produce very straight grain with curls running perpendicular to the grain and uninterrupted from edge to edge of the veneer sheet. Some reports claim that a tree which buttresses itself against north winds will have compressed annual growth rings in the area facing north and expanded rings facing south and that the stress in the compressed rings is believed to cause the fiddleback figure. I have no idea whether this is true. Many species develop this figure, but the most common ones are maple, makore, anigre, and "English Sycamore" (which is actually a form of maple). Some of the prettiest versions occur in claro walnut and koa. 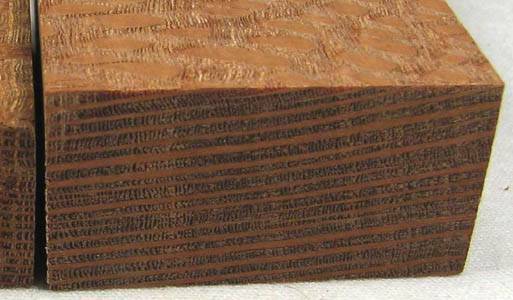 There are woods (laurel comes to mind) that have a figure that is technically a true fiddleback figure, but which is so light as to be almost indiscernible, and there are others that have fiddleback figure that only runs for a few inches of width in a plank although it may run the full length. None of these marginal figures would actually be used on the back of a fiddle, so application of that name to them is purely technical and/or a marketing ploy and should not be taken seriously. Also, plain curly is sometimes mislabeled fiddleback and true fiddleback is sometimes labeled as just curly, depending on the whims of the vendor. Below is a composite pic showing several different species with fiddleback figure. For other pics of fiddleback figured wood, see fiddleback pics. A note about "grain" and "figure". These terms are sometimes used interchangeably in a way that I believe to be incorrect. In this glossary, I take a point of view which I believe is the "correct" one, but I want to acknowledge that it is opposed to that taken by some, including a man whom I consider very much my better in regards to knowledge of wood and that is Dr. Bruce Hoadley who has written two books that are widely, and I believe appropriately, considered to be the definitive works in their field. These are "Identifying Wood" and "Understanding Wood". On this particular issue, I have a strong and supportable reason for differing with Dr. Hoadley. For a full discussion of the two points of view, and the statistics that validate my own point of view, click here: figure vs grain. I don't put the whole thing right here because this box is already too big. Had this difference of opinion been with anyone other than Dr. Hoadley, I would simply have ignored them and gone on my way and would not have subjected my readers to this diatribe. However, I think that regarding ANY other information about wood, anyone who ignores Dr. Hoadley is being foolish. As young people say these days, when it comes to knowledge about wood, "He da man". figure --- the "look" of a piece of wood. There are numerous wood characteristics that go into creating the figure, and there are numerous specific types of figure that are created due to one or more of those characteristics. Listed below are the major causal characteristics of figure and then the major types of figure, but with only a brief definition of each. Each is a URL that you can click on to go to a more full definition. Some of the causal characteristics and the figure types have the same names, so some terms appear in both lists below. I'm being very broad here in my definition of "figure" as the "look" of wood. For example, metal stain is not normally considered "figure" but it is something that affects the "look" of wood so I've included it here (doesn't seem like too much of a stretch since other stains ARE considered part of figure). fluted --- growth rings have outward "dents"
ambrosia --- heavy streaking induced by the ambrosia beetle's boring. button --- means "large ray flakes"
flame crotch --- a particular form of crotch figure also called "feather crotch"
fine grained --- (1) synonymous with closed grained and synonymous for fine textured Examples of fine grained woods are birch, cherry, and hard maple. fine grained --- (2) [less often used] Synonymous with close grained (tightly spaced annual growth rings). for both definitions, compare/contrast to medium grained and coarse grained. fine textured --- Wood that has very small pores and small cells in general and that can thus be brought to a high natural polish. Such woods tend to be harder and heavier than other woods. A good example is African blackwood. Compare/contrast to medium textured and coarse textured. flame --- An ill-defined term that is sometimes used to refer to flame crotch figure, sometimes to curly figure, and sometimes to fiddleback figure. Pick any one of those terms and you can find people who will insist that THAT term is the ONLY term that should be meant by "flame", although relatively few of them would choose "curly" as the one correct term; most would go for "fiddleback" and the rest for "flame crotch". Another term that you will see quoted as synonymous with "flame" in the sense of "fiddleback" is tiger stripe. Since "tiger strip" has the potential for confusion with ribbonstripe, and "flame" with "flame crotch", I say that if you MEAN "fiddleback", then dammit, just SAY "fiddleback". Yet ANOTHER use of the term flame is with box elder, where the presence of red streaks gives the wood the name "flame box elder"
flat cut --- [aka plain sawn] Wood that is cut on a plane that is parallel to the annual growth rings but not right in close to the pith. If the tree is a near-perfect cylinder, then this results in a plank that has relatively widely spaced grain lines running down the center and relatively closely spaced grain lines running along the edges. Most trees aren't perfectly cylindrical, so what you really get are usually variations on this, the most widely noted of which is what is called cathedral grain (in veneer in particular, this is also called crown cut) where the grain forms U- or V-shaped lines in the plank. Flat cut planks are not as stable as quartersawn but will generally perform just as well when properly kiln dried. Flat cutting can produce wider boards than quartersawing. One form of producing flat cut boards is through and through cutting. The composite pic below shows flat cut pieces of (1) American black cherry, (2) douglas fir, (3) sen with cathedral grain, (4) bocote (pic is a more red than the actual veneer sheet), (5) yellow pine, and (6) sen with cathedral grain and a very large range in the distance between grain lines, and below that is a graphic showing the differences among flat cut, rift cut, and quartersawn. flat sawn --- synonymous with flat cut. Some reports say that this term is only used if the wood is a softwood although I don't see why that should be the case, nor is it my experience that it IS the case. grain --- The annual growth rings and pores of wood. See box directly above. There are a number of terms commonly used to describe various characteristics of the pores and their effect on the wood. Because of (1) the use of the terms "open" and "closed" and "close", (2) the use of tight and close, and (3) the two different characteristic sets of open/closed and closely/widely spaced, some of these terms get damnably confusing when you see them all together but they do make sense once you sort them out. Compiling this set of terms DID make my head hurt. They are shown directly below the composite pic below which shows the fundamental characteristics of grain (ring spacing and pore size). grain direction --- The direction in which the dominating, elongated fibers or cells lie in the structure of wood. grain raising --- The swelling and raising of surface wood fibers caused by absorption of water or a finishing agent. Some wood finishes will cause grain raising upon application of the first coat and so the wood has to be sanded and/or buffed before other coats are applied. grainy --- a loose term, generally meaning coarse grained. gray stain --- An oxidization reaction in some woods, primarily the sapwoods of Southern hardwood trees, and particularly hackberry. It is a process very like that which causes apple insides to turn brown pretty quickly after exposure to air. As nearly as I can tell, there's nothing you can do about it once it appears but it can be avoided by getting the lumber into a drying kiln within hours of its having been sawed. gum pocket --- A well-defined opening between annual growth rings, that either contains gum or that contains evidence of prior gum accumulation. gum seam --- A check or shake filled with gum. heartwood --- The central, woody core of a tree consisting of inactive tissue that has support as its only function. It no longer carries sap up the tree and instead of water or reserved nutrients, heartwood cells contain substances such as resins, tannic acid, dyes, oils, rubber, or other organic compounds that provide commercial use to the timber and chemical industries and which also make the heartwood more durable and less susceptible to biodegrade than the sapwood. As a tree ages, the heartwood increases in diameter and becomes denser / harder and darker in color while the sapwood remains about the same thickness and color at the outer shell of the tree. Typically, some conifers such as spruce and pine and some flowering trees such as willows and poplars, do not contain heartwood and there are some species where the two both exist but are very similar to each other and hard to distinguish. In some trees the boundary between heartwood and sapwood is razor-sharp and in others it can be quite vague. See the term demarcation for examples. In many species it is only the heartwood that is valuable / usable, and the sapwood is discarded in woodworking. medium grained --- A somewhat loose term indicating wood that has modestly spaced growth rings and/or a medium texture. Examples of such wood include walnut and mahogany. Compare/contrast to fine grained and coarse grained. medium textured --- Wood that has a moderately smooth surface (which implies that it does NOT have large open pores. Compare/contrast to fine textured and coarse textured. mineral stain --- An olive to greenish-black or brown and sometimes even purple discoloration in wood. It is a common, and completely understandable, misunderstanding that the name is to be taken literally --- that is, that the cause of "mineral stain" is minerals brought up from the soil through the sap. This is NOT usually correct and the actual causes are unknown, although SOMETIMES it actually IS minerals brought up through the sap. It occurs in some hardwoods and the stain occurs parallel to the pores, not cross-grain as can occur in fungal stains. It is particularly common in hard maple and yellow poplar, but also occurs in other species such as anigre, hickory, basswood, and others. In hard maple, it is commonly a gray stain but in yellow poplar it can take on many colors, sometimes all in one plank, leading to some spectacularly colored wood which is then called rainbow poplar. 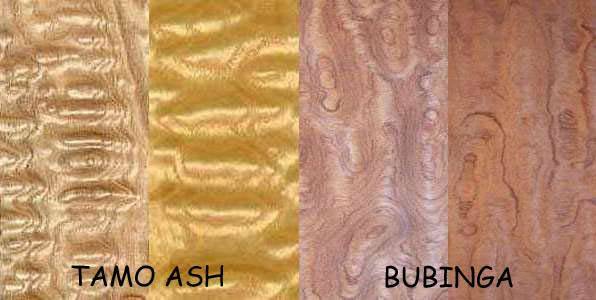 Below is a pic of mineral stain in various woods. To see more discussion and more pics of mineral-stained wood, click here: mineral stain pics. open grained --- (2) [rarely used in this sense] Synonymous with loose grained. An excellent example of wood that has this characteristic is the fast-growing wood paulownia. pecky --- Pockets or areas of disintegrated wood caused by advanced stages of localized decay in the living tree, caused by a fungus. There is no further development of peck once the lumber is seasoned.Cypress and incense cedar are two woods in which pecky condition is common and it also occurs in pecan/hickory and occasionally in other woods. In the composite image below are pecky forms of pecan, then beech, then an unknown wood. pomelle --- [Spelling variations include "pomele", "pommelle", "pomelle", and "pomele"] --- A type of wood figure that resembles a puddle surface during a light rain: a dense pattern of small rings enveloping one another. Some say this has a "suede" or "furry" look. It's usually found in extremely large trees of African species such as sapele, bubingaand makore. Some domestic species with a sparser, larger figure are referred to as blister. The term is not used totally reliably and you may encounter some confusion among the terms "blister", "pomelle", and quilted from different vendors. The name Pomelle comes from the French word for "quilted", so it's not too surprising to find this confusion. 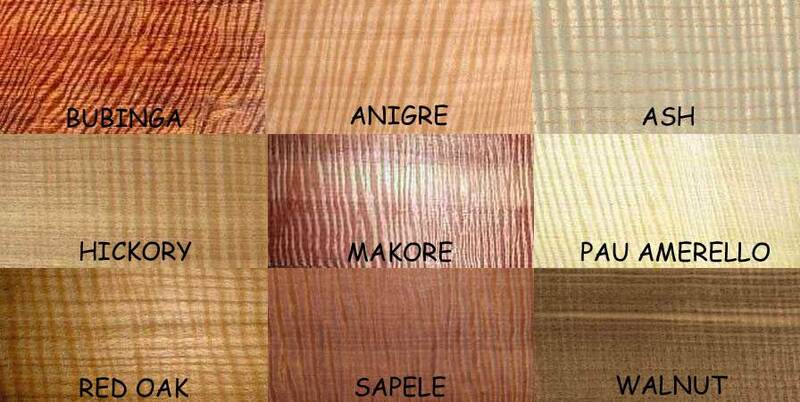 In sapele, there are even more confusing names used for variations among figure types including pomelle, so you may see "pomelle pebble", "pomelle swirl", "pomelle quilted" and other combination terms that are not necessarily used consistently among vendors. Below is a composite pic showing sapele with a heavy pomelle figure, African mahogany with a medium pomelle figure, and makore with a weak pomelle figure that most vendors would classify as blistered. To see more pics of pomelle figured woods, click here: pomelle pics. pore --- The cross section of a hardwood vessel. 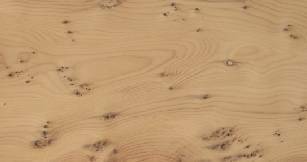 Pores figure strongly in the appearance of the grain in hardwoods (softwoods don't have pores). Woods with large open pores are difficult or impossible to bring to a fine finish unless some sort of filler is used. Many hardwoods have tiny pores (that is, they have tiny-diameter vessels) and thus can be brought to a fine natural polish. quarter cut --- A log cutting technique in which the log is cut into quarters and then each of those quarters is sliced on one face, turned and sliced on the other face, and so forth. The first cut on each quartered face produces a true quartersawn plank and another one or two that are technically quartersawn, but likely to be much less flaky and the rest of the planks are rift cut. Some reports say that all the planks from quartercutting are quartersawn, but that's nonsense and is a statement that clearly is made only by people who have no concept of geometry. True quartersawn surfaces are perpendicular to the annual growth rings and even slightly less than "true" (a full 90 degrees) quartersawn planks, the angle to the growth rings will be more than 70 degrees or so (the exact amount varies depending on what source you listen to, but it NEVER goes below 60 degrees) and for quartercut planks, that is obviously not the case as you can see in this image that shows quarter cutting. Clearly, as the cutting moves away from each quartered face, the growth rings move farther and farther away from 90 degrees to the face of the plank. Each of the planks after the first one on each face is rift cut. Quartercutting is a more difficult technique than through and through cutting but less difficult than full quartersawn cutting. Quartercutting is used because it produces more quartersawn planks than other commercially viable methods of cutting but it has the significant drawback that it produces smaller and smaller width planks. quartersawn --- A board cut with one face parallel to the rays and thus perpendicular to the growth rings. Experts disagree on just how much this angle can drop below 90 degrees and still have a plank legitimately be called quartersawn. Personally, I think it should be as high as 75 or 80 degrees but some experts quote as little as 60 degrees. Quartersawn wood is usually more stable (i.e. less prone to warping, shrinking and splitting) than that produced by other cuts. The point of quartersawn wood is to provide the very attractive flaky figure that it creates, particularly in white oak, lacewood, sycamore, and a few other woods, because of the way in which the medullary rays are cut parallel to the surface of the planks. Full log quartersawing is, however, by far the most wasteful way of cutting lumber as you can see from the figure below; in order to get every plank oriented with its face parallel to the rays, it is necessary to have lots of wide thin triangles of wood that are wasted in the cutting process. Up to 30% of a log can be wasted in this cutting process, far more than any other cutting technique. Because of this massive waste, only species that have prominent ray flakes (such as white oak and American sycamore) are cut this way. Also, it is a very awkward cutting technique because of the way in which the log has to be repositioned between cuts. Below is a pic showing a full log with all true quartersawn cutting; it is my understanding that this technique is NEVER used in commercial lumber operations because it is just too cumbersome and wasteful. Other cutting technique (such as through and through or quarter cutting) will produce a small number of quartersawn planks along with more planks that are rift cut or flat cut. quilted --- A type of wood figure resulting from interlocked grain. Quilted figure somewhat resembles a larger and exaggerated version of pomelle figure but has bulges that are elongated and closely crowded. A quilted surface looks three-dimensional when seen at its billowy best. Most commonly found in maple, it also occurs in mahogany, moabi, myrtle, and sapele, and less often in other species. A particularly dramatic form of quilted figure is known as sausage quilt. For pics of several quilted woods, see quilted pics. I've seen the quilted look described as bubbles in water under glass, and while that description is very apt for certain forms of quilting (the quilted maple in the pics below, for example) the variety of quilting figure is such that no single description is going to do the job. Here are a couple of composite pics showing various forms of quilt figure. The various forms are NOT generally unique to the particular species with which I happen to have them shown in this presentation), but there are some generalities one finds with experience, such as the fact that quilting will never be particularly strong in oak but it can be amazingly strong in sapele. reaction wood --- Wood that has different characteristics than normal wood because it is formed a process in which trees bend and grow in abnormal ways due to external stresses. Think about the kind of tree that you often see on the bank of a river where the tree protrudes almost horizontally out from the river bank and then curves upward into a bole that grows straight up in the air. Such trees start off growing straight up but lean over as the bank erodes and/or cannot support their weight as they get bigger. Then their root system gives them enough support to not fall out of the bank and they take the normal path of growing plants and head for the sky. This leaves a "crook", like the crook of your elbow (and NOT to be confused with the crook that is a drying defect). In softwood trees, the lower portion of such a crook takes on particular characteristics and is called compression wood and in hardwood trees, the upper portion of such a crook takes on particular characteristics and is called tension wood. Reaction wood is not JUST a response to gravity; it also occurs when branches are weighed down by snow for long periods and it can occur in trees that are in an area that has strong prevailing winds and have to brace themselves against it. Reaction wood, particularly tension wood, is more prone to case hardening than normal wood, takes stains and finishes differently than normal wood, and is to be generally avoided for those reasons. Unfortunately, it isn't always easy to spot reaction wood in a cut plank since the changes can be visually subtle and do not often cause any noticeable changes in the wood's figure. In doing research for this glossary, I attempted to find out what I could regarding the characteristics of the upper side of a softwood tree that has compression on the lower side and of the lower side of a hardwood tree that has tension wood on the upper side. I was not successful and if anyone can point me to an authoritative source on either of those topics, I will be grateful. My assumption for now is that these areas do not differ significantly enough from the surrounding wood to merit particular discussion. I find that a little surprising, but hey, I'm easily surprised. rift cut --- (1) A log cutting technique produced by cutting at a slight angle to the radial to produce very close to the consistent growth ring distances (across the width of the plank) of quartersawn but without the large ray flakes of quartersawn. Rift cut is most frequently used with woods such as white oak that have the potential for heavy ray flakes if quartersawn. Rift cut is used in square furniture legs so the grain looks the same from all sides. Otherwise one side would be flat sawn and the other quarter sawn, which can produce a rather jarring contrast in woods with a strong grain. Riftsawn flooring exhibits less gapping between planks than flat cut flooring during humidity swings due to the fact that expansion and contraction occurs on a significant angle to the floor rather than parallel to it. Quartersawn planks have even less movement in service than rift cut. See the graphic below definition 2 for a comparison of flat cut, rift cut, and quartersawn. rift cut --- (2) synonymous with quartersawn. I HATE the fact that this usage exists because it causes such confusion with what I consider to be the true and correct definitions of quartersawn and rift cut, but as always I don't get to make the rules, I just report on them. The exact angle reported differs depending on the authority. Some say 30 degrees to 60 degrees is rift cut and more is quartersawn but some say 45 degrees to 75 degrees is rift cut and more is quartersawn. Personally, I don't think quartersawn should be anything under 80 degrees, and I don't think rift cut should be anything below 45 degrees but then I'm picky. One intelligent authority says about the upper end that basically, hey if the ray flakes show heavily it's quartersawn and if not it's rift cut. That Sounds right to me. 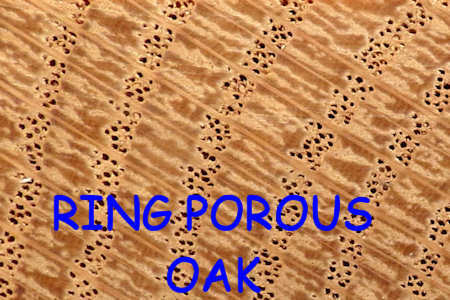 ring porous --- A group of hardwoods in which the pores are comparatively large at the beginning of each annual growth ring and decrease in size, more or less abruptly, toward the end of that early growth area and become small or non-existent in the late growth. 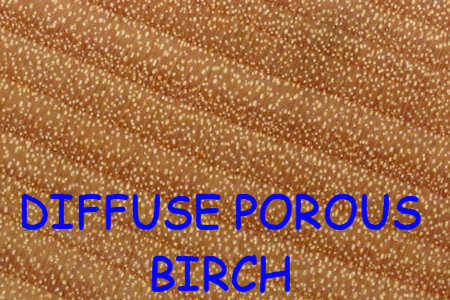 Below on the left is a pic of birch, which is diffuse porous, and on the right a pic of red oak, which is ring porous. ring shake --- A form of shake in which the wood separates along the boundary between early growth and late growth. Also called cup shake. Here's an example in kingwood (the ring shake is the circular part of the wood split), and note that this piece also has a small heart shake. root burl --- a type of burl that grows on the root of a tree. Such burls can be full of mineral deposits and even whole rocks and pebbles. Even more than "normal" burls (a weird thought, since burls are by definition abnormal) root burls tend to have voids. Like other burls, root burls can be really beautiful in their own way, but they are frequently difficult to work because of the minerals and voids that add to the inherent difficulty in working wood that is as irregular-grained as burl wood. rotary cut --- A veneer production technique where the log is put on a huge lathe-like machine with a long sharp slicer that runs the length of the log and slices the wood the way paper towels come off a roll. For softwoods, the slices can be up to 1/4" thick for use in plywood, or the more normal 1/42" regular veneer thickness that is also used for hardwoods. Rotary cut is a technique that is only available for veneer, not lumber. 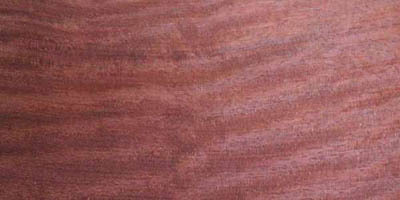 The exotic wood bubinga is given a special name, kevazingo (or kevazinga), when it is rotary cut. Many woods (bubinga and others) are rotary cut to produce a wild, swirly figure. Rotary cutting is the most economical method of producing veneer, resulting in the highest yield. That's the good news and it makes this the favored method for cutting thick softwood veneer for plywood. The bad news is that rotary cut sheets have totally inconsistent grain and are pretty much impossible to match in any of the normal veneer matching techniques. On the other hand, they are often so attractive that they can be used quite successfully in architectural panels without using any matching, and they are a favorite of craftspeople for objects such as jewelry boxes. Below is a pic of Douglas fir being rotary cut for plywood and then a pic of kevazingo (rotary cut bubinga). rough --- (2) Refers to wood that has been only very roughly surfaced (but which may NOT be coarse textured). This term can be ambiguous (as in "the plank has a rough surface", which could mean roughly finished or coarse textured, or both). For both definitions, compare/contrast to smooth. rustic grade --- A wood flooring grade in which the planks are allowed to exhibit a full range of natural character, and in some species, allows the occurrence of holes through the pieces of flooring. In exotic species, it generally indicates high sapwood content and filled knots. The word "rustic" is sometimes used to designate a wood figure but I see this an inappropriate use of the term. sapwood --- This is the living, outer zone of wood, next to the bark. In the living tree the sapwood contains some living cells (the heartwood contains none), as well as dead and dying cells. The sapwood carries water up from the roots to the branches so that they can produce the leaves that both engage in the photosynthesis that fuels the tree's growth and also produce the seeds that allow the tree to propagate. Sap, which contains sugars, comes down from the branches in the inner bark (phloem) and both feeds the tree growth that takes place in the cambium and also is fed into the sapwood by the rays where the sugars (nutrients for the tree) are stored over the winter. Sapwood is generally more permeable than heartwood and this makes it easier to treat with preservatives that inhibit decay. In some species, the demarcation between heartwood and sapwood is razor-sharp but in others it can be fuzzy and vague. The thickness of the sap layer varies considerably by species; in some species, there basically is no heartwood. Persimmon, for example, has a pencil-sized (or smaller) core of heartwood that is ebony black and the entire rest of the tree is sapwood. In some trees the sapwood is very thin, but it is always there. In some trees the boundary between heartwood and sapwood is razor-sharp and in others it can be quite vague. See the term demarcation for examples. side grain --- The wood grain as you look directly onto the side edge of a plank. Compare/contrast to end grain, edge grain, edge grained, and face grain. smooth --- (2) Refers to wood that has been well surfaced (but which may NOT be fine textured). An example of this usage would be "the plank was very smooth after planing"
This term can be ambiguous (as in "the plank has a smooth surface", which could mean smoothly finished or fine textured, or both). For both definitions, compare/contrast to rough. spalted --- Dead wood that has undergone a particular form of fungal decay that often looks like a black ink line of varying thickness and great irregularity drawn through the wood but is sometimes more vague. 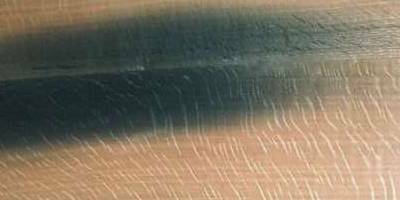 When it is very sharply defined black lines it is sometimes called "black-line spalting" --- in some trees, oak for example, spalting is rarely black-line and in fact is often VERY vague, amorphous, blotchy black or dark-gray areas. In some woods, spalting causes some color changes other than black. I've seen some spalted woods that are very colorful. Black-line spalted wood is a favorite of bowl turners since it makes for a very dramatic look, as you can imagine from the pic below. 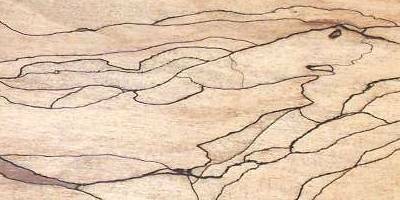 In black line spalting, the zone lines are areas where groups of fungi attack each other. The lines are lines of dead fungi. Spalting can be encouraged by keeping a dead tree moist but since spalting is a form of decay, if spalting wood isn't stabilized at the right time it will just progress further into rotten wood. Wood that is really heavily spalted and still completely solid is rare (but not unheard of), since advanced spalting is generally accompanied by enough decay to soften at least some areas of the wood. Spalted wood that has soft areas but is not too far gone into the process of rotting can often still be used in craft projects by treating the wood with a stabilizer. Below is a composite pic showing black-line spalting in maple veneer and amorphous spalting in a white oak plank. To see more pics of spalted wood, click here: spalted wood pics. spalting --- (1) The process that creates spalted wood. stain --- (1)[noun] Any one of a number of chemical agents used to change the color of wood and/or add protection from moisture. The main difference between a stain and a dye is the size of the particles of the pigment. Stains are more or less watered down paint with large pigment particles that sit on the wood and give it color but at the expense of obscuring the grain. Dyes have extremely small particles of pigment; so small that light actually passes through them. Dye particles are so small that they soak way down into the structure of the wood at a molecular level rather than sitting on top of it and yet they still change the color while having very little effect on the appearance of the grain. Still, I think anyone who stains or dyes wood should be shot. Compare/contrast to other finishing agents. stain --- (2)[verb] To treat wood with a finishing agent that changes the color of the wood (see noun definition directly above) and protects it from moisture. There is at least one type of stain, called "natural" stain, that does NOT add any color to wood but just protects it from moisture. sticker stain --- A brown or blue stain that develops in lumber where it has been in contact with the stickers during drying. This generally happens because of moisture that is trapped between the sticker and the lumber. This is NOT synonymous with sticker stripe. sticker stripe --- A strip of wood that has a slightly different color than the surrounding area of a plank because that portion was covered from air and light by a drying sticker whereas the surrounding area was not. The sticker stripe can be lighter or darker than the surrounding wood depending on how the wood reacts to exposure to light and/or air. Sticker stripes are usually cross-grain, because stickers are normally placed cross-grain. Sticker stripe is NOT the same as sticker stain. straight grain --- Wood where the grain lines run parallel to the long edge of the board. In flat cut boards the distance between grain lines varies from wide in the center to narrow at the edge whereas in rift cut and quartersawn boards the distance is much more uniform. Contrast to wavy grain and irregular grain. tiger --- [also "tiger strip"] This term is sometimes used, particularly with maple, to denote curly figure and almost always, specifically the kind of tight-curl figure that is known as fiddleback. It is also a loose term sometimes added to the name of a wood that has a striped figure. The most common example of that is Goncalo alves which has "tiger wood" as one of its common names because it sometimes does have a figure, due to wide dark streaks, somewhat like that of the stripes on a tiger. tight grained --- (1) Having closely spaced growth rings. Compare/contrast to loose grained. tight grained --- (2) This term is sometimes used, incorrectly I believe, to mean fine textured but having closely spaced growth rings does NOT imply fine textured because even closely spaced growth rings can be open pores which pretty much automatically imply coarse texture. I think this use is a case of the user having gotten it confused with closed grain which DOES often go with fine texture. tissue --- Refers to groups of similar cell types in wood. Examples would be "wood tissue" and "bark tissue"
tyloses --- A waterproof, foam-like substance that forms in the pores of some species of wood and blocks them, thus impeding or even totally preventing the movement of moisture through the pores. It is an extension of parenchyma cells. It is common in white oak and makes that wood excellent for barrels to hold liquids (tight cooperage) because in the case of white oak, the tyloses completely close the pores and make the wood impermeable even though it is porous. When wood is examined in transverse section, tyloses usually glistens. Woods high in tyloses dry very slowly and are difficult to treat with preservatives for outdoor use. water stain --- Discoloration of wood caused by water, which can cause movement and/or evaporation of the color-creating pigments in wood. wavy figure --- This term is often used as synonymous with curly figure (and even fiddleback, but is also used to describe a more gently curled figure that can either be just a very mild curly figure or can be specifically the result of wavy grain. wild figure --- A somewhat subjective term, referring to irregular markings that make a piece of wood particularly interesting. I think all would agree that a simple piece of flat cut maple with very regular grain lines would never be said to have wild figure, but how about a slightly more interesting than usual piece of zebrawood? Some might say it had wild figure whereas others would not. 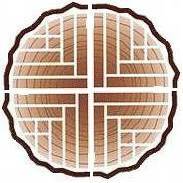 worm hole --- A hole in wood caused by the burrowing action of wood-infesting worms and insects and their larvae. See wormy for further discussion. wormy --- Having worm tracks or holes. This is a form of defect or character (depending on how you look at it) in wood where there are numerous spots and/or channels throughout the wood where it has been eaten away by various boring agents including insects, insect larvae, and worms. Sometimes the eaten away area is filled in so that there are no voids but just discolored areas. Usually such areas are punky. This is usually in the form of elongated worm-shaped areas, but may also occur as spots (much like pecky) depending on the cut of the wood and other factors. NOTE: worm holes are quite common in wood and the presence of a few worm holes does not generally trigger the designation "wormy" which, as I said at the beginning of this paragraph, is usually reserved for wood with NUMEROUS worm holes. HOWEVER, not all wood vendors agree with or follow what I just said, so you may find "wormy" wood that doesn't have many worm holes. In most trees, wormholes are far more likely in the sapwood than in the heartwood. At least one form of worm hole (and the surrounding discoloration), called ambrosia is considered a favorable characteristic and is highly favored by bowl turners. Below is composite pic showing wormy chestnut veneer, spruce with heavy worm tunnels, and the end grain of an ash plank showing both holes and tracks, plus the punky material that is sometimes left in wormholes. To see more examples of wormy wood, click here: wormy wood pics.